Most law school classes don’t involve sitting in a circle, facing the rest of the class, talking about problems that have come up during the week, and sharing ideas on how to solve them, but that’s what happened each week in the Restorative Justice Practicum taught by Annalise Buth, the first M.R. Bauer Foundation Clinical Fellow in Dispute Resolution with the Bluhm Legal Clinic’s Center on Negotiation and Mediation. 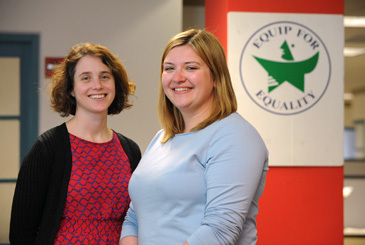 Laura Pone (JD '16) (right) with her supervisor Margie Wakelin (JD '08), worked at Equip for Equality, an advocacy organization providing legal services to people with disabilities, during her spring restorative justice practicum. “It’s not like a law school class that I’ve been in, in the best way ever,” said Laura Pone (JD ’16), one of the eight students in the Spring 2016 practicum, the first offering of the course. The practicum—where students work twelve hours per week at organizations in the community and meet weekly as a group for a corresponding seminar—is an expansion of the Center on Negotiation and Mediation’s offerings related to restorative justice, a practice that focuses on repairing harm. At the beginning of the semester, the class went through an intensive two-day training on leading circles, a core practice of restorative justice based on indigenous traditions. They used the circle framework throughout the semester during class time. “It’s a value-based communication process that can be used for resolving conflict, community-building, and healing,” said Buth. Students in the practicum were able to see how restorative practices could work not just in the outside world, but within their law school experiences. “I left our training saying every first year student in every law school in America needs to sit in a circle during October of their 1L year, because it’s a really stressful time and just knowing everyone’s on the same page, I think that would be a really powerful thing,” said Pone. Outside of the classroom, students saw the different ways restorative justice could impact communities. After taking multiple negotiation and mediation classes, and serving as a teaching assistant for a negotiations course, Pone was interested in continuing to examine alternative ways to resolve conflict, while also branching out into the public interest sphere before leaving law school. Her placement with Equip for Equality, the federally-appointed advocacy organization providing legal services to people with disabilities for the state of Illinois, provided that opportunity. During her externship with Equip, Pone worked on the team dealing with students where her duties included helping to draft a toolkit for Chicago Public School administrators. Kelly Mennemeier (JD ’16), another student in the practicum, worked for Lawndale Christian Legal Center (LCLC) for her placement. LCLC provides legal services to youth, taking a holistic approach that pairs them with social workers and mentors. In her practicum placement, Mennemeier put together mitigation packages—information and letters given to the Court supporting their clients in the hopes of reducing sentences—and attended meetings as LCLC and other Lawndale organizations prepare to help pilot the City of Chicago’s first restorative justice community court. “The juvenile court system has the possibility of being restorative justice-oriented. The kids build longer-term relationships with judges so there are opportunities for them to grow and prove themselves successful,” Mennemeier said. Pone, who will join the Chicago office of Quarles & Brady in the fall, said that even though she is entering into a more traditional practice, she expects to bring the skills she learned through restorative justice into her work and hopes more lawyers do the same. Mennemeier, who will do a yearlong clerkship in Alaska before joining Seattle firm Foster Pepper, agreed that the teachings of restorative justice can be more widely applied.